The ALTA Blow Off Valve Spring upgrade is a better alternative to the more expensive complete replacement BOVs other competitors sell. Our competitors sell you the JCW replacement part which is an upgrade for a MCS, but not for a JCW. Alta took this a step further and created this simpler, better performing spring upgrade that is for both JCW and MCS models! 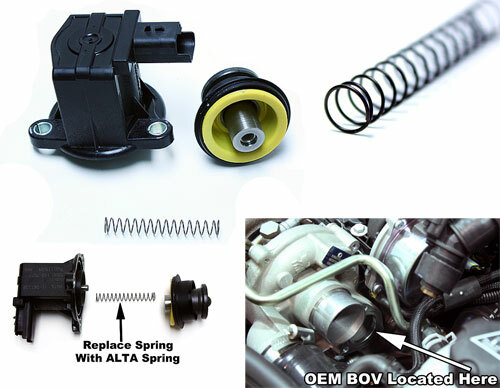 The ALTA BOV Spring Upgrade for your stock Blow Off Valve (BOV) is a very effective way to make your turbocharged MINI hold more boost between shifts, reducing turbo lag. This stiffer spring allows the BOV to function normally during normal operations but keep more pressure in the boost tubes, making it feel much faster shifting. Anyone with proper tools can install this part in under 30 minutes. Simply remove a couple of OEM parts, remove the electrionic BOV and replace the spring with the ALTA version and you're done! Tested to hold 40PSI of boost! This test fixture was created to be able to test the spring on a bench before it was installed on a car. This allowed Alta to test as much pressure as they wanted and make sure the BOV functioned as it should. Let's just say, this BOV holds and vents more boost than you will ever see! Key to the design of this part is ensuring the spring is not too stiff. Because this is an electromechanical device, it was important that the electronic part of the system (solenoid) was still able to open the BOV. Alta settled on a spring rate that was about 50% higher than the JCW, which is tested to work perfect beyond 40psi of boost! So Many Features! Our competitors simply re-sell the JCW Electronic BOV as an upgrade for your MCS. If you disect what makes these different, you will find the entire part to be the same except one item, the spring. 50% stiffer seat pressure than JCW BOV spring. Installation time is roughly 20 minutes. Custom Made Heat treated 17-7 Stainless Steel Spring Rated for over 7,000,000 cycles Makes turbo more repsonsive between shifts/less turbo lag Hold and vents 40psi perfectly! Cheaper than the entire BOV competitors sells. What is a BOV? A BOV (blow off valve) diverts pressure out of the boost system during certain driving conditions. On a turbocharged car under full throttle, boost is built up in the boost tube system and as soon as you lift throttle the throttle plate closes and the built up pressure has no where to go but backwards through the system. This is a form of compressor surge, which is damaging to your turbo, and can hurt performance as the "backup" of pressure slows the turbo down or sometimes can stop it. A BOV is used to vent this build up of pressure during throttle lift conditions. The Mini Cooper S and JCW have BOVs that are controlled by the ECU which are large solenoids that when energized opens up a valve and dumps the built up boost. The ALTA Spring is a stiffer spring to make the valve close faster after shifts and hold more boost in general.